Slenderman is perhaps better known as a terror-inducing game that starts the player off in the woods with a torch and only one objective: finding 8 pieces of paper. The catch? These 8 drawings (presumably done by a child or crazy person) are scattered throughout a dark forest. Oh…and you’re being stalked by a tall, thin, faceless creature who wears a suit and only moves when you’re not looking at him. Of course there are a huge number of sequels and spin-offs and as such the story of Slenderman has continued to grow and evolve. This is a creature that can change its size, grow multiple arms and lures children to a grisly and mysterious fate. So what is Slender Man? Slender Man is the movie adaptation of the game which is being released in just a few days. Can we expect the same sort of horror? In this article that’s exactly what I’m going to discuss. I’m going to cover a brief overview of the mythology of the infamous Slenderman, touch on the game and then I’m going to consider what the trailers have offered us glimpses of. so far. Ultimately I’m going to attempt to answer the question: Will Slender Man be worth your time and will it offer anything new and original to the horror genre? So what is Slenderman? Well, ultimately his background and motives are purposefully mysterious. What we do know is that he targets children and young adults. Why? Nobody knows. The tales surrounding the creature vary quite drastically from one story to the next. The entire mythology is regularly described as a form of digital folklore. This is in relation to the manner in which various stories change depending on the fears, the society and culture related to the individual telling the story. 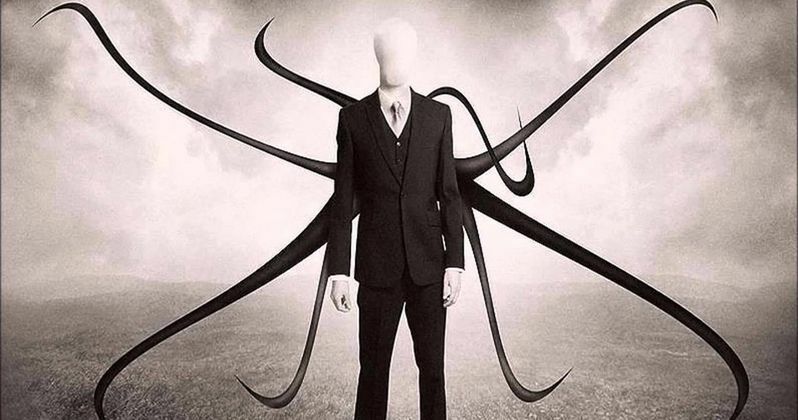 Slenderman has a symbol: a circle with an ‘X’ through it (maybe he is one of the X-Men) but other than that, very few details are consistent. Slenderman can interfere with technology in a manner that nobody understands. For example, pointing video cameras at him will create interference, yet taking photographs of him is doable. In fact, many of the early stories involved creepy, often black and white photos with a sinister character lurking in the background. One such example relates to the story of a school where a number of children mysteriously vanished. It’s not rare for depictions of Slenderman to highlight his ability to use “proxies” (people who carry out his bidding). However, he has also been known to simply turn people insane, either through fear or other methods. There are of course variations such as the creature emitting a white noise sound which acts as a signal. This lures victims to him and ultimately into his embrace. Similarly, searching for information on Slenderman (through the internet or otherwise) would get his attention and lead to him hunting you. Judging from the trailers for the movie, this will play a role within its story. Game to movie adaptations are nothing new and their success is often…non-existent. Will Slender Man be an exception? The Slenderman universe has a lot to offer and as far as horror ideas go, there’s nothing to stop a movie from being a great success. However, in order to consider whether or not Slender Man will be a good movie we have to understand what made the games so successful. Most horror games focus almost entirely on jump scares. This is a trend we see within movies nowadays as well. We’ve even crossed over into the fake jump scare i.e. where the tension builds, the moment arrives to make you a jump and then…nothing happens. Only after a brief pause does the creature jump at the character. You only have to look to Sinister, IT, Paranormal Activity and others to see examples of this. The Slenderman games don’t use cheap jump scares to build fear (although they are a secondary aspect of the game). Instead, the game builds up tension and creates intense fear before you’ve even witnessed anything! From the moment you collect the first drawing, you hear a drum beat around every 5 seconds. As the player collects each drawing the music becomes more intense and Slenderman appearances begin to increase…as does his speed and ability to appear before you: catching up more and more every time you turn around. Ultimately, what makes Slenderman a scary creature is that we aren’t sure what he is doing or why. We, as the player, are only aware of three things: 1) We’re in the woods and have no idea how to get back to society. 2) There are scary drawings scattered everywhere. 3) There is a mysterious and dangerous creature stalking us with malicious intent! So does Slender Man tackle the games and lore in such a manner as to offer the horror genre a new star? Based on the trailers, I would have to say no. Several trailers have been released and while some certainly appear to demonstrate nods to the games, they take away everything that makes them scary. For starters, the drum beat which made the games terrifying have now become some weird ritualistic summoning of Slenderman. Even in the trailers we hear “those who hear the bells toll accept his invitation. When you hear the first you must close your eyes: opening your eyes only once you’ve heard the third.” Not to mention the bizarre video tape style moment that we’ve already experienced through movies like The Ring and Rings. This is after the kids in the move click a button that literally says “summon Slenderman”…I mean c’mon! Surely, someone somewhere could have been a little more creative than that? The trailers do seem to nod to the ideas of the games and the lore in the sense of Slenderman driving people insane and using them as his proxies but then it seems like the movie falls into all the horror film clichés. Again, I’m basing this almost entirely on the trailers. Until the release of the movie in a few days, I can’t say anything for sure. However, I don’t think I’m being unfair by suggesting that this movie isn’t really selling itself with the trailers! If there is one thing I hate about movie adaptations, it’s throwing away original content in favor of tropes of that genre. We see this during almost every scene in the trailers. Whether it’s the silly looking hallucinations that seem to exist solely to make us of modern special effects or the bizarre smoke that seemingly appears from nowhere, it certainly looks like Slender Man aims to tick all the cliché boxes. Why the writers went for creating all the cheesy horror vibes instead of sticking to original content is completely beyond me. Slender Man was an opportunity to rekindle the horror genre and offer something unique. Instead, it seems likely that we’ll get the same basic horror movie story line retold with a new character. I worry that the 90% of the film is going to rely almost entirely on jump scares without building up any real tension. What can I say; I still have a little bit of hope for this movie. The Slenderman games are awesome and the internet folk-lore surrounding him is original and interesting. So hopefully Slender Man can offer audiences something that feels a little different. We can only pray that the movie isn’t just cheap jump scares and cheesy horror tropes. I mean, how many times will the female character trip during her desperate, final attempt to escape the villain? What generic paranormal activity will take place: tapping on glass? Moving chairs? Slamming doors? As this isn’t a ghost movie, I’ll walk out the cinema if any of these happen. Will all the cell phones mysteriously stop working? How many kids will appear in creepy ways? Will there be any found footage? These are just a few of the things that could ruin the movie. Usually creepy writing on the walls is something I’d hope a horror movie would avoid but given how iconic the drawings are in the Slenderman world, thy just have to be included. In almost all cases of horror movies, I’d say that found footage is an overplayed technique and has lost its spark. However, given that all the Slenderman games are first person and much of the “mythology” is also based on found footage, I feel like maybe it would have been the way to go. Although I imagine that if they were doing a found footage film then I’d probably be complaining about the exact opposite. One question we have to consider when looking at Slender Man is: Has the time been and gone for a movie focused on this character? Personally, I remember Slenderman being a craze about 5 years ago, if not more. I certainly haven’t heard anything about the creepy character in at least two years. I don’t think that it’s too late for the movie but I do think that releasing it 3-4 years ago would have packed more of a punch! Plenty of people who still remember the horror of the games and the terror of walking anywhere at night after playing them. Yet what people consider “scary” changes as times goes on and so whether the child-stealing suit-wearer still haunts nightmares or not is anyone’s guess. I’m inclined to believe that the movie will be fairly popular in the sense that people will go to see it but not in the sense that it will be highly rated. So what can you take away from this post? Well, hopefully you know a little bit more about Slenderman and the upcoming Slender Man movie! If you haven’t played the games then I would certainly recommend them! But with only a few days to go until the movie’s release, I wouldn’t suggest getting your hopes up over this one. Personally, I think that we will all forget about this movie long before the end of this year. But who knows, maybe Slender Man will shock us all! Thank you for reading! What are your thoughts on Slender Man? Do you expect it to be scary or will it fall flat? Comment down below!